In an age of e-books and screens, it may seem antiquated to create a handwritten, illuminated Bible. The Benedictine monks at Saint John's Abbey and University, however, determined to produce such a Bible for the twenty-first century, a Bible that would use traditional methods and materials while engaging contemporary questions and concerns. In an age that largely overlooks the physical form of books, The Saint John's Bible foregrounds the importance of a book's tactile and visual qualities. This collection considers how The Saint John's Bible fits within the history of the Bible as a book, and how its haptic qualities may be particularly important in a digital age. ""This book refocuses our attention on how a stunningly illuminated Bible, such as The Saint John's Bible, encourages us to meditate more carefully, look more closely, and SEE Scripture in the light of its eternal beauty. A very thoughtful collection of essays makes this a valuable resource."" --Sandra Bowden, Artist, Author, and former President of Christians in the Visual Arts ""Arguably, no other book in the history of the world has inspired more poets, artists, and musicians than the Bible. The reason goes far deeper than the literary qualities of any biblical passage. J. Baker, J. Bilbo, and D. Train's arrangement of essays in The Saint John's Bible and Its Tradition not only witnesses to the expansive imagination the biblical text engenders, but it also bears testimony to the interpretation of the Bible that the imagination fosters."" --Michael Patella, OSB, Saint John's University, School of Theology and Seminary ""This intriguing set of essays shows how illumination may happen, not just on the page but also in our minds and lives--but only if we are willing to replace our industrialized habit of 'processing' words with slow practices of dwelling on the words of Scripture, in all their challenging beauty."" --Ellen F. Davis, A. R. Kearns Professor of Bible and Practical Theology, Duke Divinity School ""The authors of Holy Scripture understand how important it is for human beings not only to think rightly about God but to taste and to see that the Lord is indeed good. . . . The way to the true knowledge and love of God therefore lies through the senses, not despite or beyond them. 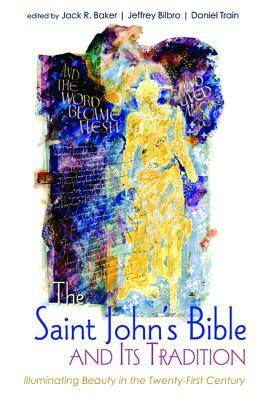 The creators of The Saint John's Bible understand this fact--and exemplify it in a work of extraordinary beauty. And the authors of this volume do us a tremendous favor by showing us how The Saint John's Bible might form us through its form. What an invaluable aid to teachers, pastors, worship leaders, and artists "" --W. David O. Taylor, Fuller Theological Seminary Jack R. Baker is an Associate Professor of English at Spring Arbor University. He is the coauthor, with Jeffrey Bilbro, of Wendell Berry and Higher Education (2017). Jeffrey Bilbro is an Associate Professor of English at Spring Arbor University. He is the author of Virtues of Renewal (2019). Daniel Train is the Assistant Director of the Duke Initiatives in Theology and the Arts.